Abdul Rashid Dostum ('Abd al-Raszhid Dostum or Dostam, born 1954 in Khojah Dukoh is a former pro-Soviet fighter during the Soviet war in Afghanistan and is considered by many to be the leader of Afghanistan's Uzbek community. His residence is in Qaisar District in Faryab Province. (20150920) He joined the Afghan military in 1978, fighting with the Soviets and against the mujahideen throughout the 1980s before switching sides and joining the mujahideen. Dostum would again switch sides and has become infamous for his switching of allegiances. 1991 he founded the political party “Junbesh” or NIMA (National Islamic Movement of Afghanistan) which was seen as a multi-ethnic party, but in fact was a Uzbek party. On May 20, 2003, General Dostum survived suicide bomber assassination attempt while at leaving the mosque for Eid Al-Adha. Before the 2004 election, stories of “warlordism,” massacres and other malfeasance surface in the western press. 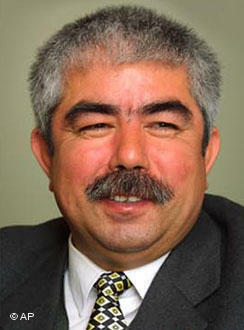 In October of 2004, General Dostum ran for President and earned over 800 000 or 10% of the national vote. Mohaqiq, Dostum’s traditional Hazara political partner, received 935,000 or 11.7% created a 21% voting block. He was appointed March 01, 2008 Chief of Staff to the Commander in Chief of the Afghan National Army a role often viewed as ceremonial. Later 2008 he was removed from his army role because of the Akbar Bai kidnapping incident. Dostum spent a year living in exile in Turkey. In June 2009, Afghan President Hamid Karzai reappointed Dostum to his post to get his support for the presidential elections in 2009. In 2009 Dostum did not run as a candidate for election, but was asked by Karzai to support his bid for re-election. In an effort to incorporate the region and ethnic interests of the northern voters, Junbesh Party organized and delivered 45% of the two million accepted (‘clean’) votes in President Karzai’s victory. Today (2011) General Dostum is involved in negotiations with hostile actors in the North on behalf of President Karzai and is supporting parliamentary elections on behalf of Junbesh candidates. Dostum has a long-standing reputation for brutality that has caused international concern, human rights groups have accused his troops of human rights violations, charges which Dostum denies. Abdul Rashid Dostum – "I will never submit myself to a government that does not drink whiskey and listens to music". This is one of the most famous phrases uttered by Dostum, the Afghan warlord from Northern Afghanistan who, over the past 25 years has fought on all sides, sometimes losing but always somehow managing to retake power. A cruel and astute master of duplicity, he has been able to attract the support of the cut-throats of the Uzbek ethnic group to which he also belongs, through his use of the carrot of generosity and the stick of exemplary punishments. In the last war against the Talebans, with the support of Americans, Dostum conquered Mazar e Sharif. Human Rights Watch is listing him as a Human Rights Abuser. Junbesh can count on 25/30 elected MPs in the Wolesi Jirga and is likely to pursue a rather homogenous political agenda. Dostum backs Karzai but will seek recompense in return for his support. Presently (2009) he lives "self exiled" in Turkey. Dostum was and is the overall leader of the Junbish party. Dostum was accused of undermining oil and gas explorations in the Amu River basin -- forcing the National Security Council (NSC) to refer him to the AGO as traitor to the nation. Deputy AGO, Rahmatullah Nazari said that they had initiated investigations on the issue after receiving a letter from the NSC. On 20120610, the NSC urged the Ministry of Interior to deploy a 300-member security squad to protect oil and gas fields in the Amu River basin in northern Sar-i-Pul province. (20120613) Militia loyal to army chief of staff General Abdul Rashid Dostum were disrupting oil exploration by a Chinese state firm, underlining the challenges facing foreign investors in Afghanistan. Supporters of Dostum were demanding a share of the proceeds. State-owned CNPC and joint venture partner Watan Group, a diversified Afghan company, will explore for oil in three fields in the basin -- Kashkari, Bazarkhami and Zamarudsay -- which are estimated to hold about 87 million barrels of oil. Dostum’s office in a statement on 20120630 said the office of military supreme commander's chief of staff was superior over all ministries and security organs and the office did not belong to the defence ministry. The letter was a serious blunder on the part of defence ministry' the statement said. The statement quoted Dostum as saying he did not respond to the letter because it had no legal basis. Abdul Rashid Dostum is set to return to Afghanistan from Turkey in the next week, a spokesman for the Islamic National Movement of Afghanistan, Bashir Ahmad Tayanj, said on Wednesday July 19, 2017. Dostum is still in Turkey. This comes after aviation authorities reportedly refused to allow Dostum’s plane to land at Mazar-e-Sharif airport, in Balkh province, on Tuesday July 18, 2017. Afghan officials told news agencies on Tuesday, Jul 18, 2017 that a private jet flying to the city of Mazar-i-Sharif, Afghanistan, was ordered to fly to the capital, Kabul, for checks late on Monday following indications that Dostum, was trying to return to the country. The officials, who spoke on the condition of anonymity, said Dostum's plane diverted to Turkmenistan. However the office of Dostum in a statement stated that all reports suggesting that the plane was forcefully diverted are false. The statement further added that the vice president is still based in Ankara city and no decision has been taken regarding his return in the near future. Dostum returned to Afghanistan in July 2018. Shortly after his arrival at Kabul's international airport, a suicide bomber detonated explosives at a traffic circle at the airport's exit, killing 20 people, including nine members of Dostum's security guards. Afghan Vice President Abdul Rashid Dostum was not harmed in ambushes by Taliban insurgents over the weekend, Afghan officials said Sunday Mar 31, 2019, as his convoy was traveling from Balkh Province to neighboring Jawzjan Province, where he house is. He survived the second assassination attemppt in less than a year. Abdul Rashid Dostum is married to a Popolazi woman. He has four sons and four daughters who live in Ankara, Turkey. He has a second wife who lives in Tashkent and Sheberghan. Two of his sons and two daughters were born from his first wife who passed away. Haji Bator Dostum and Yar Mohammad Dostum, are two sons of Haji Gen Abdorrashid Dostum.